JAB Holding has announced its acquisition of Dr Pepper Snapple Group Inc. (NYSE:DPS) for $18.7bn in cash, in what has been defined as the “largest acquisition in the non-alcoholic beverage industry”. The Luxembourg-based investment group, active in the food industry and controlled by the wealthy Reimann family, will then combine DPS with their coffee giant Keurig Green Mountain (bought in 2016 for $13.9bn). The merger will result in Keurig Dr Pepper, industry behemoth with $33bn in market value, projected annual earnings of around $11bn ($6.7bn from DPS and $4.1bn from Keurig) and net debt of $16bn. JAB will contribute $9bn cash from two funds, one connected to the Reimann family and the other to sovereign wealth funds. The residue will be covered by debt raised through J.P. Morgan, Goldman Sachs and Bank of America. Mondelez International Inc., JAB’s main partner in Keurig, will own roughly 13% of Keurig Dr Pepper, down from its current 24% stake. Dr Pepper Snapple shareholders will receive $103.75 per share as “special cash dividend” (representing a 13% premium on the average 3-month price). In addition, they will own a 13% stake in the merged company (with Keurig investors keeping the remainder), which will be listed on the New York Stock Exchange as KDP. DPS shares soared 24% to $118 the day after the takeover announcement, reacting positively to the announced $600 million cost-cutting plan (which will be realized only in 2021, and not before a $750 million one-off cost). Exactly what the new KDP share will be worth is the key question for investors in the short term. Source: Yahoo Finance. Note: “D” stands for end-of-year dividends. 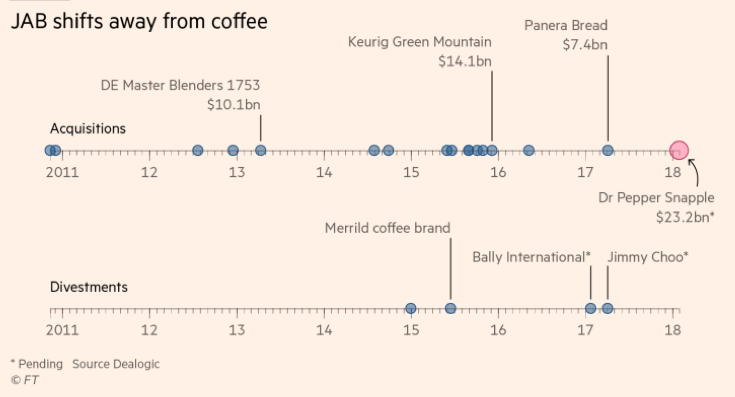 JAB, often compared to 3G, the Brazilian private equity group behind Kraft-Heinz, has already spent over $30bn in food-related acquisitions, including Peet’s Coffee, Panera Bread and Krispy Kreme Doughnuts. The hypothesis of JAB emulating LVMH’s strategy of building different brands has been discarded: the group sold their stake in Jimmy Choo for $1.2bn and plan to do the same with Bally, a luxury clothing brand. The acquisition has left several analysts “scratching their heads”, as it occurred in a particularly difficult moment for the soda business, characterised by many health-aware consumers shifting away from sugar and towards healthier and sugar-free drinks. So, it comes with no surprise that sales hit a 31-year low in 2017, with Q3 registering a 2% decline in sales for Dr. Pepper, along with an 8% fall for 7UP and 1% for Schweppes. In spite of everything, Dr Pepper holds firmly to its 8.5% U.S market share. It reported a fourth-quarter profit of $508 million (of which $297 million related to the new U.S. tax bill), compared with $165 million of the previous year. Industry leader Coca-Cola sold its stake in Keurig in 2016 after its acquisition by JAB, indicating a lack of faith in the investment group. Meanwhile, coffees and teas have been among the fastest-growing beverage categories. In 2017, sales of ready-to-drink coffees registered a 17% increase, according to Euromonitor. Why proceed with such an acquisition? The new trend of “pods” and the willingness of consumers to feel the product they are purchasing are shaping the industry. Millennials prefer to spend more for “specialty” coffee and drinks, if they can feel the underlying experience (and post pictures on Instagram). The group would benefit of Keurig’s ability in producing these pods, and could experiment the same system with soda.